When a person passes away, his possessions and assets are transferred to those left behind. However, legally speaking, different categories exist for the people that take over these assets. Heirs and beneficiaries are not the same, although either one could find herself taking possession of property left behind by a deceased person. The primary right of an heir is to inherit the property of a person that has passed away if the decedent did not make a legal document statinghis last wishes. It is not always clear who the heir is, however. For instance, if a singe parent with a single child passed away, that child would be the parent's heir. If that parent did not have a will, the heir would inherit the property in all likelihood. Sometimes, multiple heirs exist and local law determines how they share in or must divide the property. What Is Probate & How Long Does It Take? 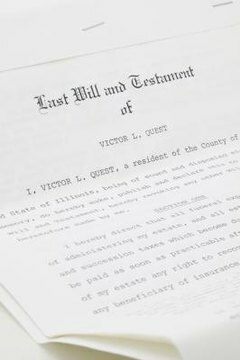 A beneficiary is someone that is named in the will of a decedent. Sometimes a will may have many beneficiaries, or only a single one. The term "beneficiary" may also be used to refer to someone that is entitled to a life insurance payout if the decedent carried life insurance. The primary right of a beneficiary is to receive what is dictated in the will. Beneficiaries have several legal rights which the executor of an estate has to respect. They can try to protest the appointment of an executor and also have the right to complain if the executor is slow in dispensing the estate. Beneficiaries that ask for information regarding the assets in the estate are entitled to receive it in a timely fashion. Any documentation associated with the estate, such as account statements and receipts, must be shown if the beneficiary requests it. The rights of heirs depend entirely upon the laws in the specific jurisdiction, but some common rights exist. For instance, an heir can receive an advancement. This is when a person pays an heir something from the estate while he is still alive. The result is that when that person passes, the inheritance of that particular heir is reduced by that amount. This is applicable mostly in situations where multiple heirs, such as siblings, are involved. Heirs also have the right to give up any claim to the estate if they choose to do so. Fredrick, Hans. "The Rights of Heirs Vs. Beneficiaries." , https://legalbeagle.com/10072722-rights-heirs-vs-beneficiaries.html. Accessed 21 April 2019.